Recently I mentioned the heat… Carcassonne was even hotter and it was full of people. There were the usual tourists supplemented by some sort of huge get together for young entrepreneurs. Add to that coach loads of school children and you get the picture – the narrow streets of the Cité were filled to the brim with humanity, all shapes and sizes, numerous languages and a fair smattering of dogs on leads. It might sound like a cultural version of hell but in fact it was far from that. There was a merry buzz in the air, people stopping to take photos and selfies were graciously stepped around, most were smiling and enjoying looking in the shops where you could buy a plastic sword or a crown, a mug with Carcassone on it or a key ring with your name, as long as it’s a French one. We stuttered along, avoiding kids and dogs and selfie sticks until we found an ice cream shop. Here we were lucky enough to also find a stone statue with steps that could be sat upon to cool the bahookie and enjoy a huge ice cream cone. Bliss. 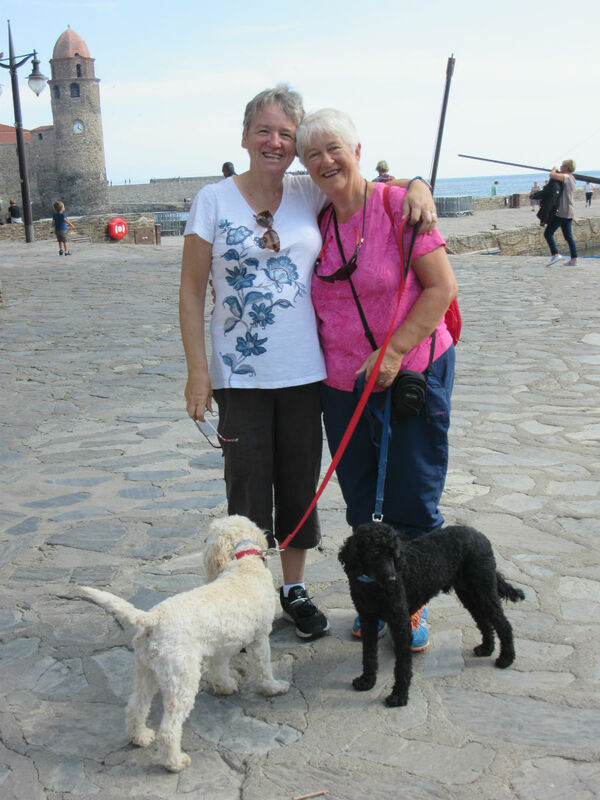 We had arranged that Shirley and Mary would do the tour of the Citadel itself while I took the dogs back to the van and stayed with them with every door and window open. Shirley and I have done the tour before so I was happy to be the one on dog duty and to grab a couple of hours with my book and a long glass of water. The dogs tried to tell me all the way back to the van that we’d left two of the pack behind and refused to be comforted, so I had no choice but to walk them backwards all the way. Them, not me – I chose to walk forwards like any sensible being but the dogs would have none of it. Once inside the van, they let me know that they weren’t pleased with the arrangement by turning their backs on me before falling asleep in the huff. Later that day we continued the nonsensical avoidance of the Carcassonne Aire de Camping Cars by driving to Limoux for the night. This was another 18 miles off our route back to the Mediterranean but it was cool, free and they had a market there the next morning. I don’t need reminding that the route to Carcassonne and back was nonsensical in every way possible so we’ll draw a line under that incident and move on – which we did the very next day to Collioure. The Aire de Camping Cars at Collioure is at the top of a steep hill overlooking the town. It costs €10 a night to stay there and in high season they put on a shuttle bus (navette) to take you into town and back. Out of season the bus does not run but the price remains the same. I felt outraged at this obvious unfairness and then gave myself a proper talking to … I was displaying Yorkshire penny pinching at its very worst. We went to the machine to pay and on the way met a German man who warned us to be careful as the machine had given him two tickets and was therefore clearly overcharging people. We approached it with caution, surveying it with suspicion and attempted to get it to speak to us in the English it boasted was possible. After Spanish, French and German it gave us a couple of sentences in English then reverted to French. I blame Brexit… We put in our card and paid for one night and it spat out two tickets. They were identical so it wasn’t giving us two nights for the price of one. Both had our number plate marked on it so we couldn’t have one each. Mary put her card in and gave it all the details it asked for – age, gender, height, weight, political leanings, marital status and registration number – it then gave her two tickets as well. It was about twenty four hours later that we worked out that the second ticket was for the non existent bus. We weren’t overcharged – just underbussed. View from the Aire de CC at Collioure. It’s a long way down. Collioure is beautiful. We loved it even though we walked down to it and back again on two consecutive days. A total of 10 miles walked, half steeply downhill with the inevitable knee trembling you get from trying not to break into a run and the other half uphill complete with hyperventilation, sweating and groaning. We encouraged one another with thoughts of a cold beer when we got back. I’ll let the photos speak for themselves but it’s a place to be recommended with the following advice: 1) Don’t go when high winds are hitting this part of the Med. The Aire is exposed to the elements on every side. 2) Do go before the last day of September and the bus will be running. After twenty four hours we were exhausted so we decided to move into Spain, just a few miles south, choosing the little town of Portbou where you could stay on the marina for a couple of nights – it was just what we needed. The route from Collioure to Portbou is not for the faint hearted. It’s a good road but endlessly twisting and turning and up and down the side of the cliffs on one side and the mountains on the other. You can’t throw 4 tons of motorhome around the corners, so inevitably we frustrated the open top BMW and Mercedes drivers who shot around us whenever it was safe and sometimes when it wasn’t. This road, it seems, is popular with sports car drivers and motorcyclists, which all adds to the excitement of being suspended in mid air above the ocean. We finally rumbled into the port and got settled beside the yachts. We were sheltered by high cliffs on one side and the harbour wall on the other, which was just as well as a massive storm came in overnight complete with thunder and lightning. The oppressive heat was broken and the next morning when I walked the dogs around the harbour it felt cold. It was raining, a vicious NW wind was blowing and I was glad to be wearing warm trousers, a jumper and a raincoat. How quickly everything changes! We had lunch that day in a traditional Catalan restaurant at the harbour, enjoying their old fashioned attention to detail with excellent service and well cooked good plain food. They assumed we were French, given that most of the other people there had obviously driven over from France to enjoy the food and no doubt the prices. We didn’t try to explain but settled for ordering the food from the menu printed in English with phony French accents. After lunch and a little nap, Mary went off with her sketchbook and we talked about what small tasks we might undertake if only we could be bothered. We couldn’t so we didn’t. And so we began the journey in the direction of Sitges, where we plan to visit Shirley’s brother, Chris. Continuing our plan of moving relatively short distances each day, we decided to visit an unusual Motorhome Parking on a dairy farm just south of Girona. Here, it seems, you can stay for free on proper pitches with electric hook up and water on each pitch in exchange for buying a few items in their farm shop. We thought this was a grand idea and we approached the area intrigued as to what we would find. The first thing we found was that neither of our satnavs could actually get us to the farm without inviting us to drive down tiny pathways. Having done a nifty two vehicle reverse onto a road, Mary offered to lead the way and we followed gratefully. We found ourselves in the hot, silent square of a tiny village at siesta time and no way of knowing what to do. Suddenly, a cyclist all dressed in lycra appeared along with an old man from one of the houses facing the square. Somehow, with very few words of English on their part that included “No police, no problem” and absolutely no Spanish from us they managed to persuade us that it was ok to turn around and drive up a one way street the wrong way and follow the cyclist who would take us to the farm. He did this cheerfully and left us with a merry wave as he shot off on his bike leaving us beside the motorhome parking. Just when we thought that things couldn’t get any more strange, they did. We drove in and tried to decide where to park. There were already four vans in place and we weren’t sure if we should park between them or go over to a couple of spaces facing them. Mary tried asking a Dutchman, making that common assumption that he would speak flawless English. He didn’t but he waved his arms around a bit and suggested we could be almost anywhere except beside him. In the meantime Shirley, outside the van and attempting to help me onto one of the other spaces, was accosted by a German lady who thought we should be right beside her van. We were less than enthusiastic when it turned out that she was travelling with seven dogs and two grandchildren. It was hard to decide which of her travelling companions would be less appealing. The children were under five and appeared to have a penchant for playing with stones as projectiles and the dogs peered at us suspiciously from the large garage at the back of the van. In the end we got ourselves shuffled into place, amazed at the curious people you meet when travelling and we relaxed. Our neighbour turned out to be amusing, if a little eccentric. As well as her seven dogs, she had another dog at home, thirteen cats and four horses. The children were better behaved than we dared to believe and her dogs were quiet and biddable. We were left feeling grateful for the fact that we only have to be responsible for two dogs and ourselves. Beside the shop there was a brilliant little farming museum to visit. Our favourite was the miniature versions of local buildings. This one of the Church has a tiny lit altar inside. Peering through the tiny door we found its altar all lit up. This is the first time we have been given hospitality by a working farm. They provided free water, waste and electricity, children’s playground, picnic tables and a friendly welcome. What extraordinary generosity. Thank you Granja Mas Bes, we really appreciated it. Next time – Mary’s encounter with a randy donkey. Bet you can’t wait. River by the Aire at Limoux. Great to hear about your travels once again. As usual always a great read. A randy donkey and you make us wait, you tease. 😲. great read as usual. Excellent blog and most entertaining!! I am loving hearing about your escapades. There was a woman on the radio the other day complaining about the Uk pension and fuel costs. She argued that she could not afford to keep warm over the winter so went with her 7dogs and campervan to Southern Europe for the winter….but she wasn’t German, mybe related though. Lovely reading, you make me wish for a smaller motorhome, I cannot imagine hurtling round those bends in the bus!